Dragon Door: How did you get started in calisthenics and gymnastics? Steven Low: I started with gymnastics when I was a young child and continued for about 5-6 years until middle school. While I was a student at the University of Maryland College Park, I participated with an exhibitional gymnastics troupe called Gymkana. I performed with them all throughout my 4 years of college. I also helped teach their summer camp, and came back as a coach to help out after I graduated. Training and coaching are both things I really enjoy. One of the great things about the Gymkana troupe is that approximately 75% of those who participate don't have any previous gymnastics experience. Working with them has given me a lot of experience working with people who want to learn gymnastics and bodyweight skills, but did not train as children. Dragon Door: What do you think are some of the most important concepts presented at the PCC (Progressive Calisthenics Cert)? 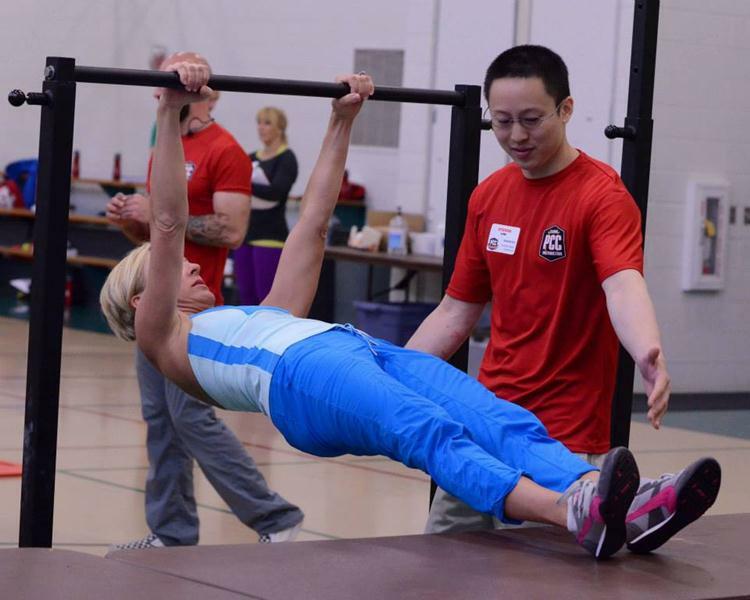 Steven Low: I like the non-dogmatic approach to learning bodyweight exercises. For example, with bodyweight squats there's no one perfect technique because everyone's body is a bit different. One interesting subtlety is how much the feet should be turned out, which is typically between 0-60 degrees. I prefer about 10-20 degrees for most of the people I coach, but it really depends on their hip mobility. Someone with the hip mobility of a 70 year old couch potato will need to coached differently than a ballerina—especially at the beginning. Other variations in technique regarding knee, hip, and back angles as well as how low to squat all have their places depending on an individual's goals. The PCC instructors come from a diverse set of backgrounds, but we bond because of the commonalities we see in all exercises. Coaches of specific disciplines might feel differently, but that's because some sports and disciplines may require much stricter guidelines—and I think students of a particular discipline should stick to their specific sources. For most people, especially those interested in progressive calisthenics, the non-dogmatic approach seems to work effectively. We aren't training people to be gymnasts, break dancers, or martial artists; we are teaching them how to use their body to get stronger and healthier. At the PCC, we teach multiple lines of progression and how apply them for many fitness levels. For example, to work towards one arm pushups, you can start with straddle legs, working from the knees, or using raised boxes/stairs to make the exercises easier or harder. Multiple lines of progression can help someone who's having trouble performing the exercises a certain way to still perform quality work and attempt to fix the problem by trying a different progression. It also allows trainers and clients to have a variety of exercises which work towards the same goal. Dragon Door: What are some of your current goals? Steven Low: One goal is to finish the new material for the 2nd edition of Overcoming Gravity. Hopefully, I'll have that finished by the end of the summer. In my training, I'm mostly focused on climbing and working to regain my one arm chin-ups and perform heavier weighted dips. If I have time I'll probably work on sprints or heavy deadlifts. Dragon Door: How has your background in gymnastics and bodyweight training helped with your climbing? Steven Low: It's helped immensely. I've been bouldering less than a year and I mostly work problems in the V6-V8 range now (V0-V16 is one of the scales of difficulty). Usually it would take at least five years or more to progress to this level. Coming from gymnastics with good overall proprioception and kinesthetic awareness—the feeling of how my body moves in space—really sped up my progress with climbing along with core tension, hip positioning, and foot placements. Obviously, I have a good base of upper body strength from the progressive bodyweight exercises as well. The main thing holding back my progress is a lack of finger and grip strength as the holds get smaller. Since I haven't been climbing very long, I'm not fully versed in the movements and terminology, so it's sometimes hard for me to see the lines on the problems and I make them harder than they are supposed to be. It has definitely been a rewarding experience to learn a new sport. Gymnastics involved a lot of repetition to really perfect skills and learn new ones. In climbing, no two routes will ever be the same, so there's a lot of variety. I don't normally recommend a lot of variety specifically in bodyweight strength training because it stalls progress, so I've enjoyed having a sport with lots of variety. Dragon Door: How do you think general training populations can benefit from bodyweight training? Steven Low: When we enter this world, we first learn how to manipulate our bodyweight by crawling, rolling, pulling ourselves up, climbing, lunging, squatting, and walking. As a child, learning to manipulate your own bodyweight in space is about exploration, you test your capacity to move in an efficient manner. Schools are actually antithetical to our nature of movement—we sit, study, and use our brains, but our bodies become movement poor and this only exacerbated through college and desk jobs. Movement is life. Bodyweight exercise and gymnastics training takes us back to many fundamental movements. It's a way to progressively increase and explore the limits of your ability just like when we were children. It's good to work with objects like barbells, dumbbells, and kettlebells, but I feel like most people are naturally drawn to bodyweight exercises. The challenge of seeing how many push ups they can do, or working towards a first pull up or muscle up is exciting. The idea of pushing your body to the limits with bodyweight exercise seems more tangible than barbell lifting. Most people won't always understand the significance of being able to deadlift 2.5x your body weight, but everyone understands a first pull up, a 10 second freestanding handstand, or finally getting a one arm pushup. The excitement that accompanies the mastery of bodyweight movements draws people in to greater accomplishments. They become excited about their workouts and it's contagious. That's one of the great things I saw at the PCC workshop, the participants were as excited about the others' abilities to learn new movements and skills as they were for their own progress and discoveries. It's rare to see this outside of competitive events. Dragon Door: What's your favorite exercise to coach? 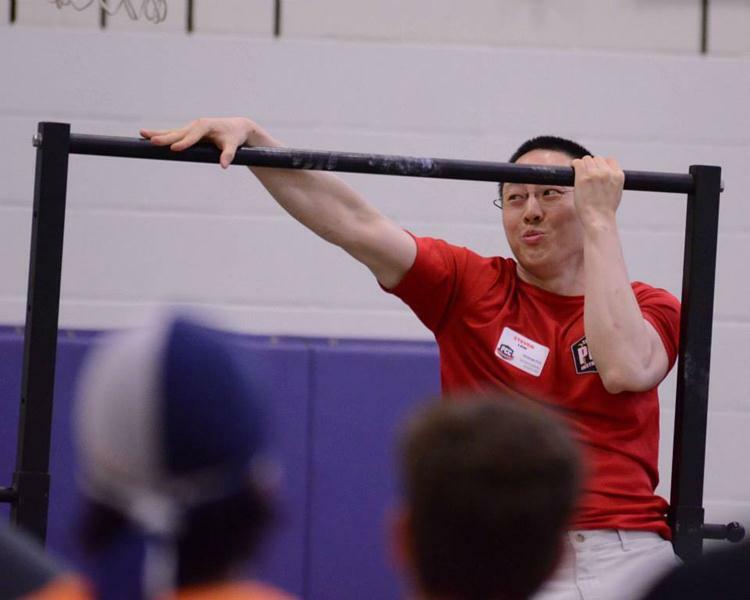 Steven Low: Definitely the muscle up. Its an awesome skill to coach because it is so rewarding. Most of the people I coached at the PCC and many in the gym already had the strength to do a muscle up, but didn't have the technique. Depending on the person, it usually only takes some specific cues to help them with the pull up, dip, or transitional phase to get their first muscle up. Their enthusiasm after a first muscle up is much more infectious than any other skill because they've been trying to achieve it for so long. If you can help someone with their muscle up, they'll love you for life. It's fun and rewarding at the same time. Dragon Door: In your opinion, who can benefit the most from training with a PCC Instructor? Steven Low: It sounds like a cliché answer, but almost everyone. But in all honestly, the average overweight "Joe" or "Jane" who hasn't exercised in years that would immediately benefit the most. The Western world has a huge problem with obesity and sedentary lifestyles. Most people rarely exercise and are movement deficient—they need to re-learn how to move and do bodyweight exercises. As a physical therapist, I've seen patients in the hospital or nursing homes who can barely roll over in bed or stand up. Unfortunately this will become increasingly common as more and more of the population becomes overweight and sedentary. People need to learn how to move again, and progressive bodyweight exercise is a great step in that direction. Additionally, even the very easiest progressions can help people get stronger, gain movement awareness and with proper nutrition, lose fat. 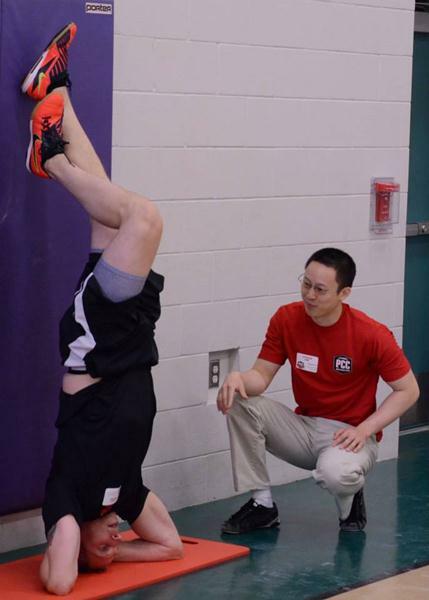 Dragon Door: What attracted you to study physical therapy? Steven Low: After college, I didn't want to work in a lab so I volunteered in a hospital and worked in a physical therapy clinic for a while. I had also gotten interested in injury rehabilitation and treatment because of participation in gymnastics, parkour, and discussions with CrossFit enthusiasts on internet forums. This led me to see that injury rehabilitation is very similar to workout programming except it's focused on regaining performance with damaged tissues. I've always have a huge interest in workout programming. The main reason I wrote Overcoming Gravity was because there weren't many good resources for bodyweight strength programming. Physical therapy is a great field because it's a relatively stable job where I can work extensively with patients and build relationships with them. So it was a pretty good fit for my personality and compliments my interest in programming. Dragon Door: What’s next in your career? Steven Low: My physical therapy licensing exam for physical therapy is coming up in about a month, and I want to complete the 2nd edition of Overcoming Gravity before getting a job in physical therapy. Bodyweight training is relatively underutilized compared to weight training, and I think that's because there's not a lot of information on how progressive bodyweight training can be used for gaining strength and hypertrophy. I plan to work in physical therapy for a while and continue coaching Gymkana. 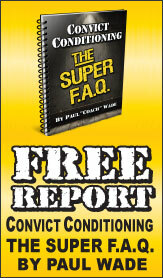 I am interested in writing more about specific injury rehabilitation and bodyweight/barbell hybrid training. There's so much to do and so little time! I never really expected to end up writing a book, but the popularity of the programming articles on EatMoveImprove.com showed me that it was a popular topic with a lot of interest. So, my plans may change depending on what future opportunities crop up.